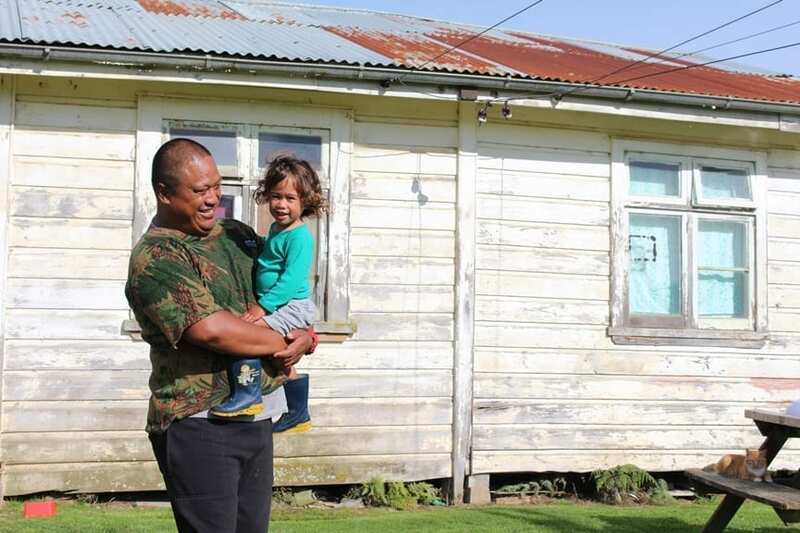 Waitetuna man Edward Thompson is creating new memories with his son in the same century-old house he grew up in, on whanau land which many generations have called home. Edward (47, Ngati Mahanga) a single parent who has shared care of his only son, 18-month-old Sunnah, met Habitat for Humanity Central North Island last year after Sunnah had been in hospital with a serious respiratory illness. The Waikato District Health Board’s Whare Ora programme referred Edward to the charity, after first asking how well his house was insulated. “I cracked up and said, you will have to come out and have a look, if you want to,” Edward said. So the team visited and saw the house had no insulation, and draughty and broken windows. The whanau had done its best to maintain it over the years, which included fixing up interior linings with plywood and repairing the roof a few times. Edward grew up there with his parents, three brothers and whangai sister. “We weren’t rich, we just made do with what we had at the time,” he said. Edward was back living at the whanau home after two decades in Christchurch, where he worked in roading construction. He returned to help care for his unwell father, his son’s namesake. Shortly after Sunnah snr passed away, Edward decided to stay in the area, and then Sunnah jnr came along. He said it made sense that he would live in the family home in the valley, which is on his hapu’s land, and just one paddock away from their urupa (cemetery). When he’s not at the local kohanga reo, Edward’s son Sunnah likes to play in the sun or sit on the stationary quad bike and watch the trucks go past up the gravel road. But last winter was a different story – Sunnah was really sick. Edward said there were some times they huddled under a blanket for warmth. The old house had taken a hammering over the years. Edward said they otherwise had to use torches at night and on dim days. The hot water wasn’t reliable, and while there is a fireplace, Edward said it’s too old and unsafe to light – the house was really, really cold in winter. Habitat’s home repair programme helps low-income homeowners to make critical or necessary repairs with no-interest repayments made over up to five years. Habitat arranged for the house to be rewired, including sorting out the hot water wiring, installing light fittings, power points and a heat pump. Sunnah also uses an electricity-powered pump to help with his breathing. Plans to demolish the old chimney and to replace the roof and spouting are underway, also part of the Habitat home repair programme. And Whare Ora are supplying new curtains, tracks and blankets for Edward and Sunnah. Find out more about Habitat for Humanity Central North Island, and how you can support our work.